It’s fun to see America exporting something good for a change. That’s how America was founded, by rejecting the old ideas, and forging a new frontier…of thought. The Tea Party movement is now officially in China. And according to some, the movement will have the same impact that it has had in America, and unfortunately for the communists in both countries; the Tea Party movement is here to stay. 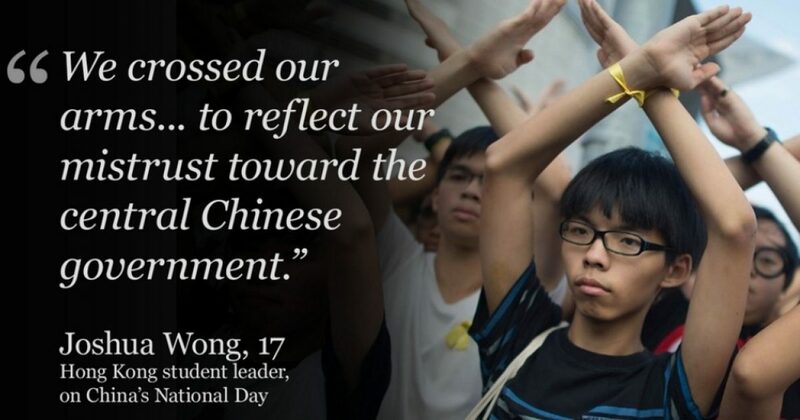 Hong Kong’s youth increasingly identify themselves as ‘Hong Kong people’ rather than Chinese. An effort to bring the mainland’s ‘patriotic education’ to Hong Kong in 2011 failed – resulting in wide gaps in core values. This thought mimics what’s happening with America’s Millennials, who grasp for their own identity, having been told who they are to be for so long by Leftists. As pro-democracy street protests swell and recede inconclusively in Hong Kong, Beijing may feel little pressure to give way. But the wave of discontent that has swept the city over the past two weeks threatens much greater challenges to China’s rule there in the future. “There will be a long period of confrontation,” predicts Ting Wai, who teaches politics at Hong Kong Baptist University. “The recent movement may stop, but the conflict will continue,” he adds, fueled by fundamentally different views of what Hong Kong should look like. I wrote earlier about Hong Kong’s Tea Party movement which rejects having people assigned to them politically, so in effect they have no voice. Behind the dispute over how Hong Kong’s next leader should be elected lies an awkward contradiction at the heart of the city’s status since its handover to China in 1997: “one country, two systems” as Deng Xiaoping put it. For Beijing, “one country” is the key priority. For most Hong Kongers, “two systems” is what they care most about. China by way of Hong Kong’s Tea Party movement is demanding to keep capitalism as it’s core government. The recent trouble boiled over when the Chinese government insisted that all candidates running for Chief Executive in 2017 elections should be vetted by a committee stacked with Beijing loyalists. Choose any color, so long as it’s red, Hong Kong voters have been told.